With the workshops behind us and the 2013 Annual Meeting coming to a close, Assistant Vice President, Member Relations of LIMRA Sean O’Donnell addressed the audience to outline some of the challenges and opportunities that face fraternal organizations and the life insurance industry in general. Among one of the most interesting statistics he shared was that, although more U.S. households than ever acknowledge their need for additional life insurance, people seem less willing to actually make the purchase and ownership levels are decreasing. What we can take from this, is that the opportunity is there, we just need to find more new ways to reach potential customers. After O’Donnell’s informative presentation, we heard from Bill McKinney, incoming Chair of the Board for 2013-14, who shared the vision for his term. He shared his concept that we need to focus more on the “why” and less on the “what.” This means the focus needs to return to helping communities and families, the very reason that fraternals originated. The Alliance is surely in very capable hands under McKinney’s leadership and I am looking forward to seeing what he will offer to our societies over the coming year. Finally, rounding out the official presentations from this year’s program was Craig Kielburger, who co-founded the non-profit organization Free the Children when he was just 12 years old. The organization aims to empower youth to become socially engaged by providing aid to children in developing countries. 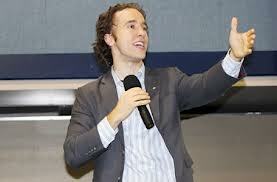 Kielburger’s presentation was electrifying; he clearly has so much passion for what he does. He had many great strategies that we can borrow from as fraternals in our quest to involve more youth. He was truly inspirational to all of us who had the opportunity to hear his message, especially given what a profound difference he has made at such a young age. Kielburger certainly deserved the standing ovation he received. If you would like to learn more about his initiatives, visit www.freethechildren.com. All of his organization’s materials are very well done and I highly recommend you check them out. And just like that, the 2013 Annual Meeting has reached its conclusion. I’ve had a wonderful time as guest blogger and I can’t recommend attending the meeting enough. Visit this space soon for a recap of Saturday night’s reception and beach party, as well as some final thoughts on the meeting. Joe, you and your staff did an outstanding job of providing us with another meeting with great speakers and pertinent topics. This information and your leadership can only make our industry stronger. Thank you!